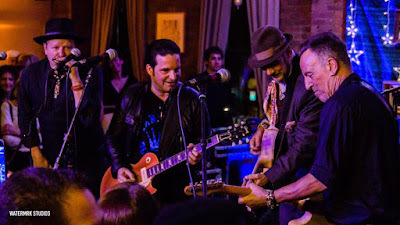 Bruce Springsteen made a surprise appearance at a benefit show in New York City on April 13, and video from the event is streaming online. Named after the late daughter of Springsteen’s co-manager Barbara Carr, The Kristen Ann Carr Benefit – which raises money to fight sarcoma cancers – honors a different person each year who has aided in their cause. This year the organization shined the spotlight on New Jersey photographer and filmmaker Danny Clinch, who has worked with Springsteen through the years, among others. To donate and/or learn more about The Kristen Ann Carr Fund, visit sarcoma.com. The singer has been keeping an extremely low profile since wrapping up his “Springsteen On Broadway” series in December after 236 performances at the Walter Kerr Theatre in New York. Springsteen received a special Tony Award for the Broadway run and released a film and companion soundtrack album upon its completion.